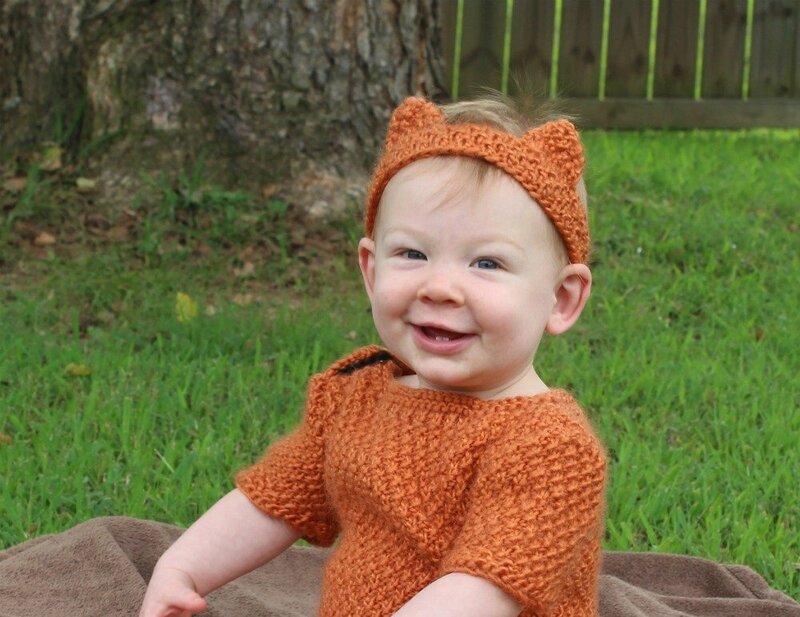 Baby Kitty Costume - Free Knitting Pattern - love. life. yarn. This costume was just as much fun to photograph as it was to make!! My little guy is nine months old and is at such a wonderful age right now – crawling, sitting up, standing and feeding himself. He did a great job modeling this outfit for me. I really thought he was going to hate the headband (since he seems to hate hats!) but he didn’t notice it at all and left it in place the whole time. We got all the shots for this pattern in about 10 minutes – a record for sure! While I do lots more crochet than knitting I still love to get the needles out, especially when fall comes around. Now that we are in September I forsee a lot more yarn in my future. I tend to slow down in the warmer months which I know a lot of other knitters and crocheters do, too. But once the fall season is here, even if it’s still pretty warm out, I’m ready for more yarn in my life! We have still been in the 90’s during the day so I didn’t put anything on those baby legs, but by Halloween our nights get chilly so I know I’ll be putting something on his little legs. I do plan on him wearing this for his first Halloween! 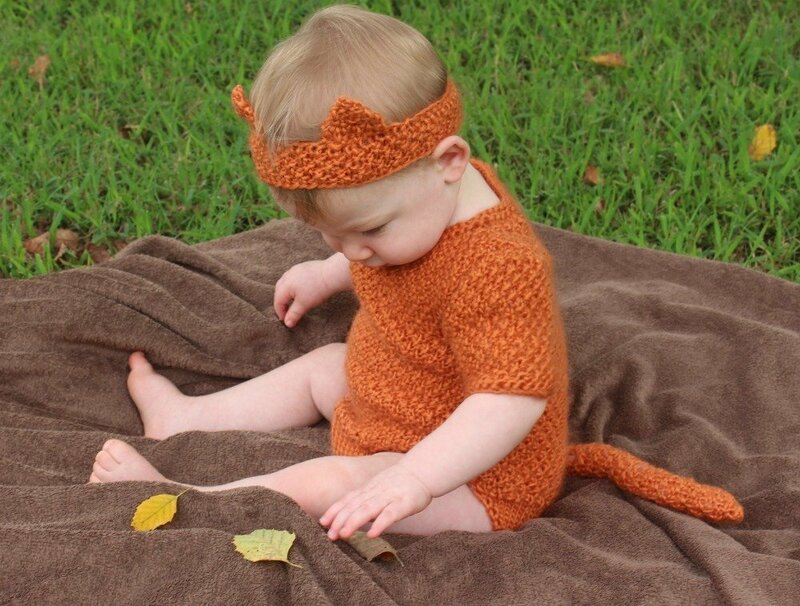 He has already outgrown the crocheted baby onesie I made earlier. 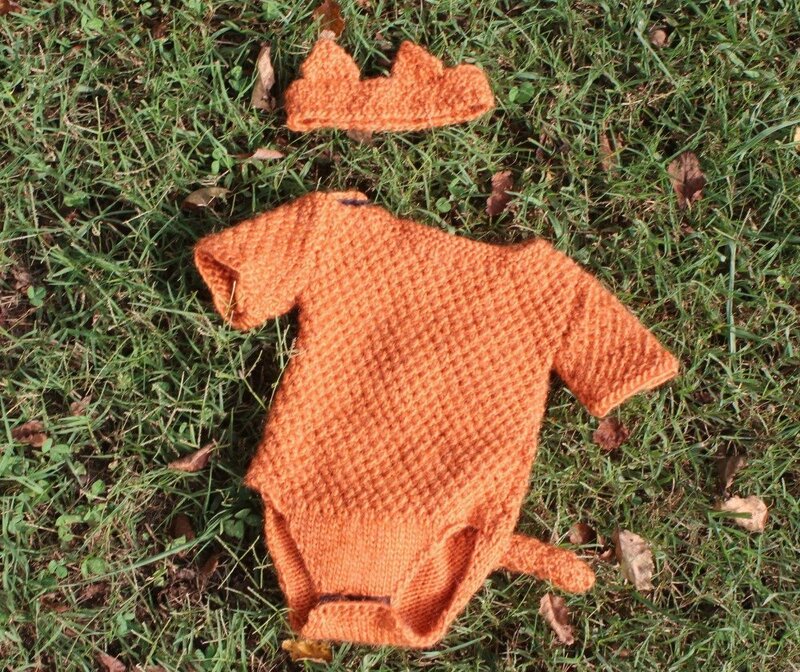 If you haven’t seen it, be sure to check out the Baby Bat Costume. I made it in a 6 month and this one is a 12 month size. 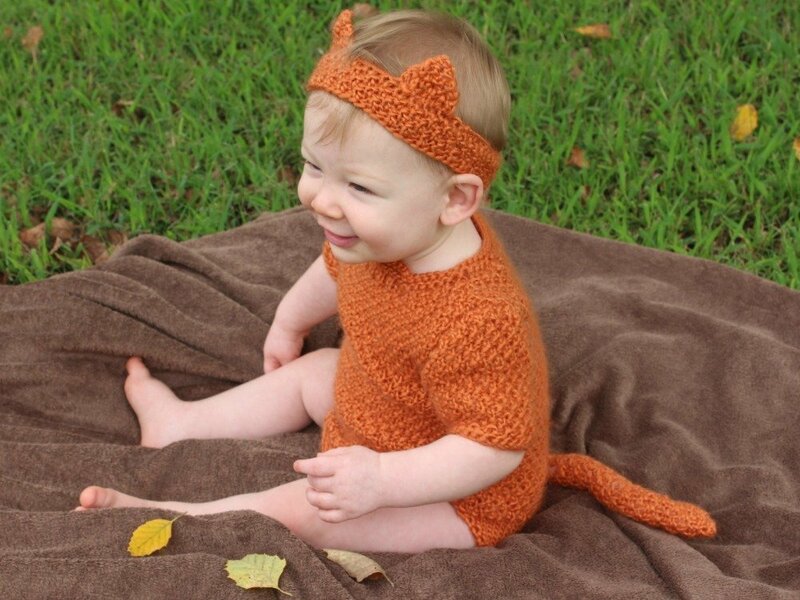 I’m really feeling the baby onesies lately and plan on making more before he gets too old to wear them for me! 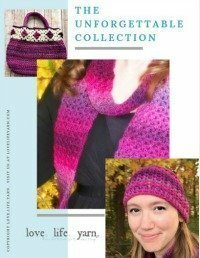 This pattern is best for an intermediate knitter because you will need to keep the seed stitch pattern going while shaping the sleeves and armholes. It’s also best if you have some finishing knowledge as this pattern has set in sleeves and uses snap tape at the crotch area and shoulder, although I found when I was putting him in this that the seed stitch is elastic enough to skip the snap tape at the shoulder. I didn’t even unsnap it and it was still super easy to get over his head. I love the snap tape at the crotch because it makes it more like the onesies you buy at the store. The headband is made in the round with dpn’s and then the ears are made separately and sewn on. I like hats better, but if you have a baby that doesn’t like hats like mine, then a headband might just be the ticket! Like I mentioned before, he didn’t even seem to notice he had this headband on while he always rips off a hat or hoodie. Next I’m planning on doing some things for my older boys to wear. I feel like I have to spread out my projects when I make them for my boys so no one feels left out or just gets hand me downs (although, when you have four boys the younger ones invariably get hand me downs!). I’m working on an exciting new sweater pattern that I can’t wait to share with you all and I have another baby blanket pattern going – some of the most popular patterns on my site! Row/Rnds 1-2: *K1, p1; rep from * to end. Row/Rnds 3-4: *P1, k1; rep from * to end. Rep Rows/Rnds 1-4 for patt. When working decreases, be sure to work in dss pattern as established. Increases are work as knit into front and back of st (kfb). Row 4: K1, inc, k to last st, inc, k1 – 14 (16) sts. Rows 6-7: Rep Rows 4-5 – 16 (18) sts. Rows 8-9: Rep Rows 4-5 – 18 (20) sts. Rows 10-11: Rep Rows 4-5 – 20 (22) sts. Rows 12-13: Rep Rows 4-5 – 22 (24) sts. Rows 14-15: Rep Rows 4-5 – 24 (26) sts. Rows 16-17: Rep Rows 4-5 – 26 (28) sts. Rows 18-19: Rep Rows 4-5 – 28 (30) sts. Rows 20-21: Rep Rows 4-5 – 30 (32) sts. Rows 22-23: Rep Rows 4-5 – 32 (34) sts. Rows 24-25: Rep Rows 4-5 – 34 (36) sts. Rows 26-27: Rep Rows 4-5 – 36 (38) sts. Rows 28-29: Rep Rows 4-5 – 38 (40) sts. Rows 30-31: Rep Rows 4-5 – 40 (42) sts. Rows 32-33: Rep Rows 4-5 – 42 (44) sts. Work 42 (44) rows even in dss patt. Rows 1-2: BO 1 st at beginning of row, work in dss to end – 40 (42) sts. Work even in dss patt as est for 16 (18) rows. Row 1: Work in dss patt across first 12 (13) sts, place next 16 sts on holder, join another ball of yarn and work in dss patt across next 12 (13) sts. Work both sides at same time. Dec 1 st at neck edge every row for 5 (6) rows – 7 sts. Work even in dss patt for 2 (3) rows. BO Back right side sts in est pattern. Knit 3 rows on left side. BO Back left side sts knitwise. Row 4: K1, inc, k to last st, inc, k1 – 12 (14) sts. Rows 6-7: Rep Rows 4-5 – 14 (16) sts. Rows 8-9: Rep Rows 4-5 – 16 (18) sts. Rows 10-11: Rep Rows 4-5 – 18 (20) sts. Rows 12-13: Rep Rows 4-5 – 20 (22) sts. Rows 14-15: Rep Rows 4-5 – 22 (24) sts. Row 16: CO 5, knit to end – 27 (29) sts. Row 17: CO 5, purl to end – 32 (34) sts. Row 18: Rep Row 16 – 37 (39) sts. Row 19: Rep Row 17 – 42 (44) sts. Work 2 rows in St st as established. BO all sts in est patt. Rows 4-7: Work in dss patt. Row 8: Inc 1 st each end, working in dss patt as est – 32 (34) sts. Work even in dss patt for 5 (7) rows. Rows 1-2: BO 1 st at beg, work in dss patt as est to end – 30 (32) sts. Working in est dss patt, dec 1 st each end every row 3 times, every 2nd row 5 times, then every row 3 times – 8 (10) sts. Work even in dss patt for 2 rows. Work in dss patt for 10 (12)”. Working in est dss patt, dec 1 st each end every row 3 times – 4 sts. BO all sts leaving a long tail. Pick up and k64 (66) sts along neck edge. Sew snap tape to right shoulder seam, overlapping garter stitch edge. Tack sleeve edge in place. Sew Sleeves and side seams. Sew Tail seam, stuffing lightly with fiberfill as you go. Sew Tail in place, using photos as a guide. With DPNs, CO 66 (76) sts, divide evenly among 3 needles. Join, being careful not to twist. Work in dss patt for 7 (9) rows. BO all sts loosely in est patt. Row 1: Work even in dss patt. Row 2: Ssk, work in dss patt to last 2 sts, k2tog – 8 sts. Row 3: Work even in dss patt. Rows 4-5: Rep Rows 2-3 – 6 sts. Row 6: P2tog, k1, p1, p2tog tbl – 4 sts. Row 7: *K1, p1; rep from * to end. Row 8: Ssk, k2tog – 2 sts. Row 9: K2tog – 1 st.
Sew Ears to Headband using photos as a guide. That’s it! 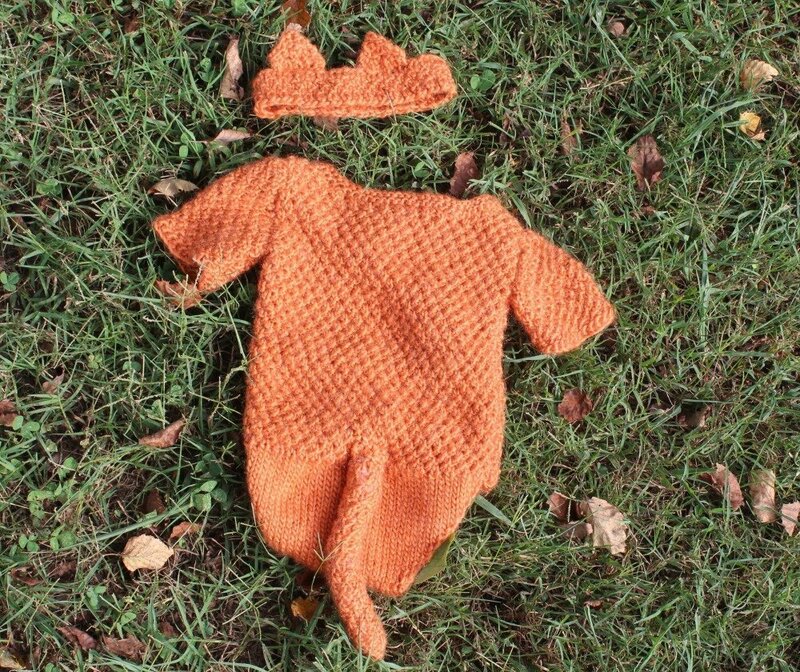 I hope you’ve enjoyed this free knitting pattern. 🙂 Be sure to check out my other free knitting patterns, too!